Technology is split into several categories such as Physics, Power, Biology etc. The first stage in the technology research process is to make a discovery. A certain number of RP have to be collected in a field before it can yield a discovery, after which it has a percentage chance each turn based on RP/turn to yield a discovery. Example, Physics Level 1 requires 100 RP and the player has 24 RP per turn. 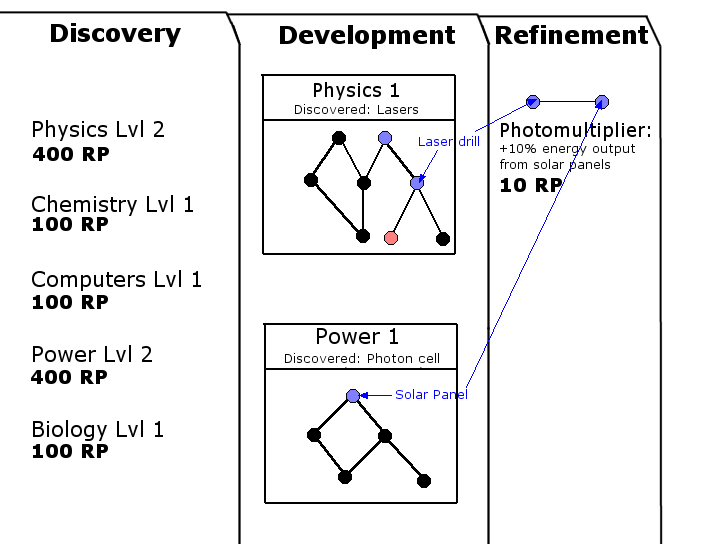 Once 100 RP are invested, the player has a percentage chance each turn (based on RP) to yield the discovery, which in this case is "Laser Physics". Once discovered, that field becomes available for Development research to develop it into technologies. Development research is used to develop specific technologies from a discovery. Once the field's discovery is made (either through the discovery panel, a random event or captured tech), its tech tree appears in the Development tab. Each field contains a tree of technologies, which the player has to choose a single path through. Once a technology in the tree is researched, all technologies in its level of the tree are unresearchable. The amount of RP per technology is typically 1/10th the RP required for the discovery. Refinements are small bonuses to existing technology caused by the application of another technology from another field to it. Once certain combinations of technologies are researched, a refinement will be listed in the Refinement tab. For example, once I have researched both Solar Panels and Laser Drills, the refinement "Photomultiplier" becomes available, which gives a bonus to the solar panels. RP per refinement is typically 1/8th of the total rp for all techs in the combination.